In 1794 John Boydell produced two volumes of aquatints showing interesting views of places alongside the River Thames. He included a map of towns and villages close to the river. Plumstead has no place on his map. Deptford, Greenwich, Charlton, Woolwich and Erith all appear and, further inland, Lewisham, Eltham, Shooters Hill, Crayford and Dartford fill up the "metropolitan" part of North West Kent. But what happened to the village of Plumstead? There is surely no way that Boydell’s mapmaker could have been unaware of the small village standing on the edge of many acres of marsh land. Behind it, to the south, the ground rose steeply to Plumstead Common, which stretched to the heights of Shooters Hill and the Dover Road. The one thing that Plumstead did not possess was any building of great architectural or historical value. The “Great House” on the corner of Riverdale Road and the High Street was the most impressive building in the village but hardly ranked against the grand country houses of Greenwich or Blackheath. Lesnes Abbey, close to the village, was not excavated until the twentieth century and was actually in the Parish of Erith. However, not all 18th century mapmakers ignored Plumstead. It is quite clearly marked on Andrews, Dury and Herbert’s map of 1794 showing the small village built around St. Nicholas Church and some thin development westwards along Plumstead High Street towards Woolwich. The ordnance factory housed in the “Warren” at Woolwich (later the Royal Arsenal) had not yet spread over the vast acres of Plumstead Marshes. 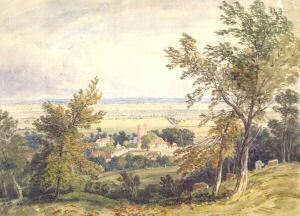 Plumstead Common and the slopes of Shooters Hill contained very few houses. The “Pott Houses” of the brick makers were the most dominant feature on the western side of the common. Fishing, farming and fruit growing had kept the people of Plumstead busy for centuries. After all, the name “Plumstead” means “place where the plum trees grow” and the site may well have been chosen by Roman Londoners for out-of-town orchards where the fruits that they had introduced to this country could be grown. Long after the Romans departed Plumstead had a moment of glory when the body of Archbishop Alfege, murdered at Greenwich in 1012, was taken from St. Paul’s Cathedral in London for reburial in Canterbury Cathedral. The funeral procession used the lower road from Southwark and so passed through Plumstead Village. It is not difficult to imagine the excitement that day in June 1023 and the many tales told about it. There were two major events that influenced the early 19th century development of Plumstead. The establishment of a major ordnance factory in east Woolwich at the end of the 17th century and its inevitable growth over the years must be seen as the prime reason for Plumstead’s 19th century population explosion. The impact of Britain’s imperialist dreams demanded an ever-growing fighting force armed with the latest weapons. The largest threat to Britain, however, was Napoleon and his declared intention of becoming the ruler of Europe. By the time the Napoleonic Wars were underway expansion inside the “Warren” was impossible and the Board of Ordnance leased about 150 acres of Plumstead marshland alongside the “Warren.” In 1805 King George III recognised the importance of his Woolwich works and officially changed the name to the “Royal Arsenal". With the introduction of new methods and machinery, brought about by the advances in industrial manufacture, the workforce would be sure to increase. The long march of the Arsenal eastwards had begun. The Pattisons of Burrage House, which stood close to the eastern boundary of Woolwich, realised that their Plumstead lands would prove to be more valuable than they had imagined. In Merthyr Tydfil the 19th century opened with the trial of the first locomotive. A Trevithick steam engine dragged wagons loaded with bar iron and seventy people for some miles. The whole adventure was deemed a success. The “railway age” was launched and the first railway to be built in London, the London to Greenwich, opened in two stages between 1836 and 1838. The line was unable to progress beyond Greenwich due to unacceptable plans to take the train line through Greenwich Park. In 1844 the London, Chatham and North Kent Railway Company started building their line from London to Woolwich via Blackheath. Very quickly this was extended to serve the North Kent riverside towns, Canterbury and Dover. Woolwich was opened up and so was the western part of Plumstead. Once again the Pattison family made money from selling “Pattison’s Sandpit” for the site of the new Woolwich Arsenal station. This opened in 1849. The relatively newly built Burrage House on the low slopes of Plumstead Common was demolished, and a strip of land used to take the railway line from Woolwich Arsenal Station onwards to North Kent. The first major housing development in West Plumstead was served by Woolwich Arsenal station. 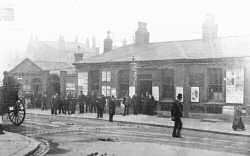 There was no station in Plumstead until 1859.